In 1988, Amy Peacock’s passion for the outdoors led her to move to the Green Mountain State to raise a family with her husband, open her own physical therapy practice and make a difference in the lives of others. Then at the age of 50, she strapped on a pair of skis for the first time and at the same time decided that she wanted to do more in the way of volunteering. She found Vermont Adaptive Ski and Sports, and for her, volunteering with the organization has been a great way to make a positive impact while staying active. “We live in a state that has amazing opportunities for outdoor recreation, and I wanted to be a part of making sure that anyone with a disability has the same opportunities that many of us take for granted,” said Peacock. She volunteers as often as she can both winter and summer with Pico Mountain as her home base. This year she also was a volunteer at Vermont Adaptive’s first C.O.R.E Connections health and wellness program and was the coordinator for the adaptive riders at the fifth annual Long Trail Century Ride to benefit Vermont Adaptive. Last winter Peacock volunteered with Joanna Watterson for Vermont Adaptive as a ski instructor at Suicide Six in Pomfret for a young woman, Jessie Tenson, from Zack’s Place. With the help of Peacock and Watterson as coaches, Tenson pushed herself to the limits and strove to be in the Vermont Special Olympics. “It was a huge honor to be able to support this amazing young athlete as she raced and won a gold medal. I will never forget the joy on her face, the respect shown to her by the Vermont state trooper who shook her hand and the genuine excitement from the other athletes as they congratulated her,” said Peacock. It is the passion and dedication of individuals like Amy Peacock that help make Vermont Adaptive Ski and Sports the successful organization it is today and help people with disabilities rediscover their potential. 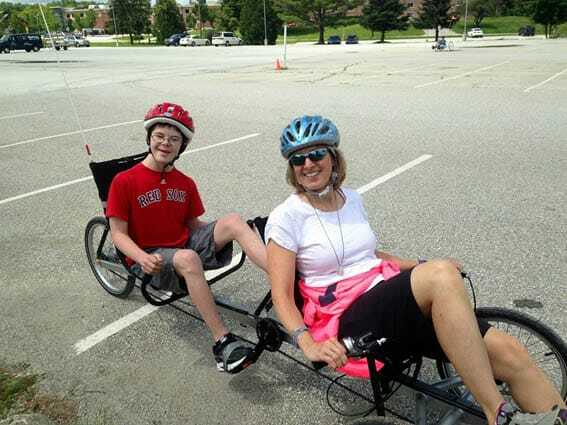 At Vermont Adaptive more than 400 trained volunteers dedicate their free time as summer and winter recreational instructors throughout the entire state of Vermont, as well as providing support for fundraising and events. Collectively, Vermont Adaptive volunteers put in more than 17,000 hours annually and the organization would not be where it is today without the undying support of these individuals. Becoming a volunteer requires a passion for the outdoors, commitment to helping others, and an interest to learn more about various disabilities. The level of experience required for summer volunteering depends on the activity you want to volunteer for, but for winter volunteering you must be an intermediate to advanced level skier/rider. You must be willing to volunteer five days per year in addition to your training days and also be willing to volunteer at one of our special events or fundraisers. Required volunteer off-snow training begins in November and will be held at Pico Mountain on Nov. 7; at Bolton Valley Ski Area, Nov. 15; and at Sugarbush Resort in Warren, Nov. 21. On-snow training also is required and is held in December. for more information and to view the requirements necessary to become a volunteer. Egos, please keep your fingers out of the machinery!